Prominent & Leading Manufacturer from New Delhi, we offer hydraulic door closer, self closing sliding door, hygienic sliding grp doors, hygienic bi-parting sliding grp doors, hygienic sliding grp fire doors and hygienic sliding fire frp doors. 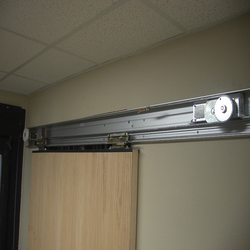 SELF-CLOSING sliding door closers incorporate a Hydraulic Door Closer and wire – chain system. Once opened by hand, SCA Series will return the door closed, smoothly and gently, controlled by three independent adjustable valves. SCA Series is a high quality, manual sliding door closer solution for smooth open and close operation, offering a wide range of models and with a host of benefits. Design – Its functional design will allow any sliding door to become self closing. Designed for door panels of either single, bi-parting and telescopic configuration. Safe – Since opening is smooth, the sliding door can be easily be opened by hand, depending on door size and door weight. Silent – We achieve near silent and smooth motion thanks to reinforced resin rollers and our aluminium rail which eliminates excessive noise. Quality – Highly reliable, using only quality parts, SCA Series sliding door closer can adapt varied door widths and weight capacities with many models available. Installation – With all parts installed directly from the front, any component can be moved during or after installation. Parts can also be added or replaced with ease, greatly reducing time spent at site. Adjustment can be achieved simply making MICOM-NHN sliding door closers quick to install and setup. Braking – Closing speeds and braking speed can be regulated by its own speed adjustment valve on the door closer body. Hold Open – The door can also be held in the open position by the addition of a ‘hold open bracket’ fixed to the rail. Once in the hold open position, by simply pulling the door, the closing cycle will begin. Delivery – available from Japan as a pre-assembled sliding door closer or as a component building KIT. Suitability – Commercial Entrance or Main Door: For installation in Airports, Hotels, Hospitals, Shops and Stores, Liabries, Schools, Office Buildings and Factories and in the Home. Self Closing Sliding Door Closers, using spring and damper device to close sliding door smooth and automatically without electricity require. Eco-friendly self closing sliding door closers for all kinds of barn doors material such as timber, steel, and aluminum) and this sliding door closer are used for commercial, industrial hospital(ICU door) and residential. Damper mechanism and spring technology, suitable for the doors 10-150kgs (22-330lbs) weight. Mechanical door closer – Manual-open + automatic-close (full-range). No electric power source required – works anytime even during power outage, ideal solution for all places. Utilizes spring wire device and rotary gear damper for safe and smooth self-closing + soft-closing. Dual Speed Control – Both closing speed/dampening speed are adjustable. Very light door opening force, smooth closing action. 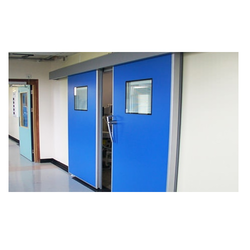 These doors are provided with lead protection for use in X-ray environments. 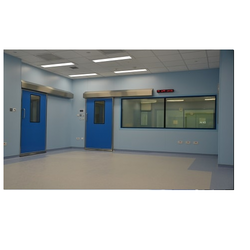 Nice-Automation’s hygienic sliding glass reinforced doors have been designed for non-fire rated areas. 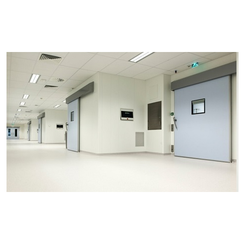 The hygienic qualities of our doors mean they are well suited to operating theatres. Their smooth and seamless construction makes them easy to clean and ensures they do not harbour bacteria. Nice-Automation’s glass reinforced polyester (GRP) doors are resistant to the latest cleaning regimes. Sliding doors can operate manually or under automation. Nice-Automation’s sliding GRP doors have been designed for non-fire rated areas. Sliding doors are regularly used in this sector as it increases the size of the door opening. Durable but flexible design means that these doors can stand up to operational traffic and wash down routines. Our systems can be connected to many types of activation devices from basic push button to a fully integrated Building Management System. Nice-Automation’s hygienic bi-parting sliding GRP doors have been designed for non-fire rated areas. 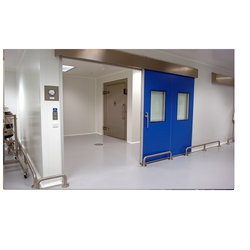 The hygienic qualities of our doors mean they are well suited to operating theatres. Their smooth and seamless construction makes them easy to clean and ensures they do not harbour bacteria. Nice-Automation’s sliding GRP fire doors have been designed for use where fire safety needs to be taken into account. Nice-Automation can offer sliding GRP fire doors from F30 to as much as F120. Nice-Automation fire doors have a concealed intumescent strip. Having a concealed intumescent strip reduces the surface area on which bacteria can gather. Nice-Automation’s hygienic sliding fire doors have been designed for use where fire safety needs to be taken into account. Nice-Automation can offer UL certified doors from F30 to F60. Nice-Automation’s fire doors have a concealed intumescent strip. Having a concealed intumescent strip reduces the surface area on which bacteria can gather. 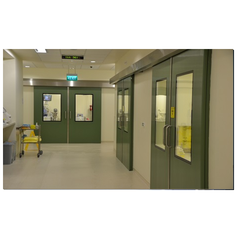 The hygienic qualities of our doors mean they are suited to many levels of laboratory up to Bio Safety Level (BSL) 4. They combine impact resistance with a perfectly smooth ledge free finish compliant with GLP requirements. Nice-Automation’s glass reinforced polyester (GRP) doors are resistant to the latest cleaning regimes such as vaporised hydrogen peroxide (VHP) which corrodes traditional steel doors. Nice-Automation’s hermetically sealing sliding doors have been specifically designed with a patented track system so it seals perfectly against the floor and frame. 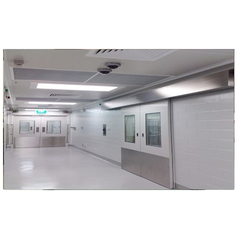 This reduces cross contamination, expensive air handling costs and helps to prevent dirty air entering the room. Nice-Automation’s hermetic sliding doors are designed to comply with the strict standards imposed by medical sectors. 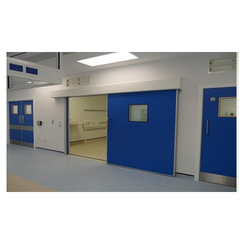 These doors are ideal for operating theatres as they seal perfectly when closed helping to prevent cross contamination and reduce the incidence of wound infections during operations. Faced with ledge-free HPL they are easy to clean requiring minimal maintenance. These doors have been tested to 60 minutes fire resistance and are available with X-ray protection. Hermetically sealing doors are available with manual operation or automation. 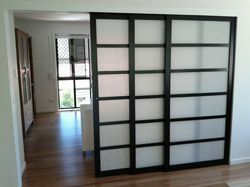 Looking for Sliding Doors ?